Bob Belcher is just man with a passion for meat. Burgers, that is. Some of his creations include the “Total Eclipse of the Havarti Burger,” the “Cole Came, Cole Slaw, Cole Conquered Burger,” and even the “Take a Leek Burger” (which comes with sauteed leeks). Yes, his creations might go unappreciated by his regulars, like Teddy, the guy who once tried to eat a sponge, but WE admire his guts, his skill with a patty and his sheer determination to be the best burger man the world has even seen! Of course, we also have a healthy appreciation for that mustache too! Chances are, you probably admire one of those things about Bob too, otherwise you probably wouldn't be eyeing this Bob's Burgers costume! 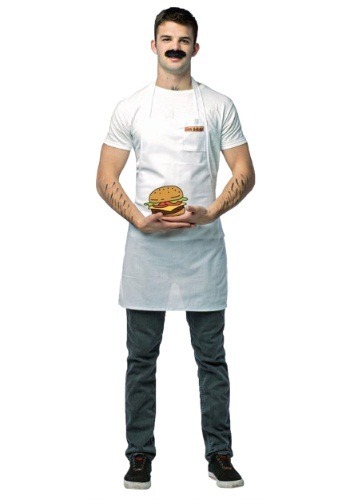 This licensed Bob's Burgers Costume will have you looking like the swarthy burger chef from the cartoon series. It comes with his signature apron, so you'll be ready to grill up one of your newest burger sensations, like maybe the “Fry Hard Burger” (burger with a hard fried egg), or perhaps you could attempt to “Chick Cor-Pea Burger” (comes with chick peas). We also recommend starting an intense rivalry with that pizza chef across the street, Jimmy Pesto.